The Winship Cancer Institute of Emory University is Georgia’s first and only National Cancer Institute–designated cancer center. The cherry blossoms were in bloom, and the Washington, DC, Convention Center was a bustling hive of activity during the 38th Annual Congress of the Oncology Nursing Society (ONS), held April 25-28, 2013. Although planning for survivorship care is recognized as an important part of the continuum of cancer care, end-of-treatment summaries (TSs) and survivorship care plans (SCPs) are not universally provided to cancer patients, even at centers of excellence. In 2013, approximately 65,000 people will be diagnosed with kidney cancer and two-thirds will be men. 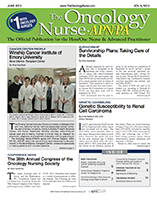 The Oncology Nursing Society (ONS) held its 38th Annual Congress in May while the 2013 Annual Meeting of the American Society of Clinical Oncology (ASCO) took place this month. T-DM1 was the first antibody-drug conjugate to gain US Food and Drug Administration approval for HER2 (human epidermal growth factor 2)-positive metastatic breast cancer. Evidence-based guidelines translate research into practice and are intended to reduce variations in cancer care and promote excellence. Oral Chemotherapy: What Does the Oncology Nurse Need to Know? Oral chemotherapy presents unique issues, including safety and toxicity, and advance planning is essential. True mentoring is more than just answering occasional questions or providing ad hoc help.